Wordstock and a dinner party! Hi all. I’m back in Seattle, after spending the weekend in Portland at the Wordstock Festival to support the launch of Ghost Music. This was my first time at Wordstock but I’d love to visit again. It’s an annual book and literary festival with workshops, publishers on hand, and, of course, lots and lots of books. I sold out of books the first day (though to be fair we only brought a few copies and had planned to use the event as more exhibit than selling opportunity). I met a lot of really, really nice people. 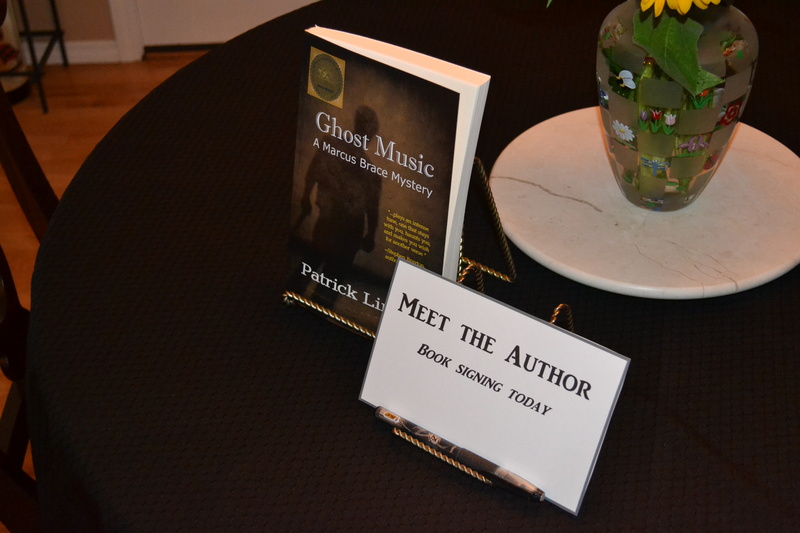 Booklovers, I think, are a pretty good bunch 😉 I had lots of requests for more info on Ghost Music and handed my business card out to a number of interested readers. And I had a chance to get to know my publisher and a few other Oak Tree Press authors better–they are a great bunch. The festival, in short, was a success! Saturday night I was treated to the best dinner party I’ve ever been to. I walked in to find an entire meal themed around Ghost Music and a murder mystery. The food ranged from “Killer beef tenderloin” to “Plot-twist potatoes” to “Alibi asparagus,” courtesy of chef Sheryl K. I also found an autograph station where the group had me sign their copies of Ghost Music. And just behind it, I discovered a “step-and-repeat” backdrop for photos. I cracked up. They are a creative, fun group. The wine flowed freely. Smiles opened wide. Laughter became the background noise. It was an amazing night, an amazing weekend. Many, many thanks to Katie, Sheryl & John, Beth & Mike, Haley & Nathan, and Megan for putting everything together. In other good news, Ghost Music continues to gain positive reviews and reader feedback is coming in on Amazon. Give it a look when you get a chance! Ghost Music now available at Amazon!